While relishing the 10-year cheddar he received as a Father’s Day gift, my husband commented that he can only remember eating processed cheese as a kid. Are you kidding? Ye, who has lived in America’s Dairyland all of thy days? Truth is, back when we were growing up in the 1960-70s, food selections were much different than they are now. In some ways they were better. High fructose sugar and super-gluten weren’t major ingredients. Nor were the fruits and vegetables genetically modified and void of flavor. On the other hand, nowadays some of our foods are actually better. As the dairy and strawberry days of June come to an end (wow, so fast! ), I can’t help appreciating the culinary artisans we have now that we didn’t back then. Cheesemakers, like Chris Roelli of Shullsburg, WI, have moved beyond mass-production boredom and back to the traditional handcrafting of age-ripend cheese. Farmer’s markets and CSA farms, like Hillsong Ridge Farm, of Springfield, WI, get us out of the over-processed grocery stores and into cooking with locally grown fruits and vegetables. All in all, both food consumers and producers are much more sustenance savvy. Creating quality food takes time and effort. 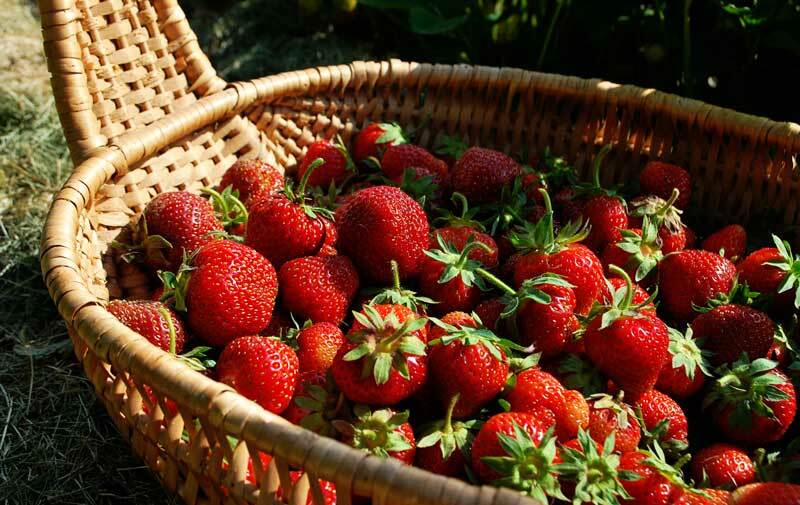 The mouthwatering strawberries in that basket? Fresh-picked today and completely organic? Just saying—a lot of back-bending, manual labor went into producing them. They’re so worth it, but I can’t imagine doing this at a scale larger than I do for my family. Knowing this, I wonder about the work that goes into running a CSA. Or an organic bakery. Or pasture-raised pork. These food artisans certainly aren’t doing it for the money—after all, we all know Americans don’t want to pay much for their food. Will the day come when these hardworking foodies simply get tired? Will they someday decide they need to make a more lucrative living? Is this just a passing culinary moment in time? I sure hope not. What communication can we do to make sure this doesn’t happen?